Have you heard of The Silk Mill? It’s a company in France that produces silk thread for needlework. It’s a nice company – professional, friendly, and… silk producing. What more could you want? I had the opportunity to try out some of their threads this week, and so I thought I would introduce them to you. The Silk Mill produces an amazing color range of silk threads for hand embroidery and other needlework techniques. They have over 500 colors, and it looks as if they are producing new colors with regularity. Along with the packet of threads came a very nice brochure with all the colors (with corresponding names and numbers) illustrated. I’m just weird enough to really enjoy spending time looking at these types of brochures. I read them. Yes, I do! Like a book. There isn’t a lot of information in the brochure, but I read the names of all the colors and look at the colors. I am sure this is a result of my fiber infatuation, but at the same time, I think it’s also an attraction to color. I find the variety of names we give to colors fascinating! The brochure groups the colors according to… well, colors! So in the yellow group, you’ll find great names like Tiger Flower Yellow, Golden Sultana, Corn-on-the-cob, Saffron Crocus, Yellow Wagtail, and so forth. In the Orange list, some of the colors are Glazed Carrots, Firecrest, and Mexican Sunset. In the pink list, try Salmon Mousse and Popsicle Pink! 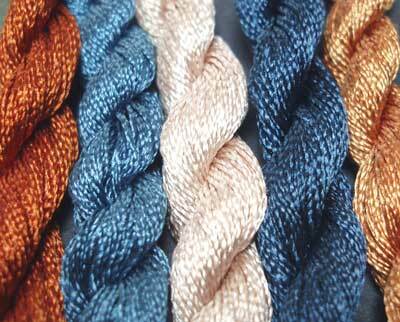 Besides individual skeins of colored silk, the Silk Mill packages skeins in different “theme” colors. For example, the package I’m reviewing here is titled “Winter at the Beach,” and the colors correspond to a wintery beach. There are color packs (they call them mini-sets) titled enticing names such as “Moonlight and Champagne,” “Summer Dress,” “Winter in the Woods,” and so forth. And all the colors work for the names! I love that! You can purchase The Silk Mill threads individually, but they are more cost effective if purchased in groups of ten, or in mini-sets or full sets. Here, you see my first set of Silk Mill silk, “Winter at the Beach.” It’s a five-skein set. The sheen on the silk is quite nice! This is monofilament silk, so the sheen is much higher than that of spun silk (like Soie d’Alger). 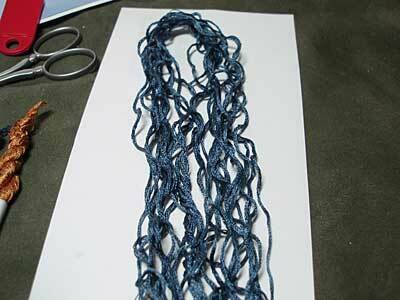 The skeins are actually a twist that, when untwisted, come apart into a large circle. 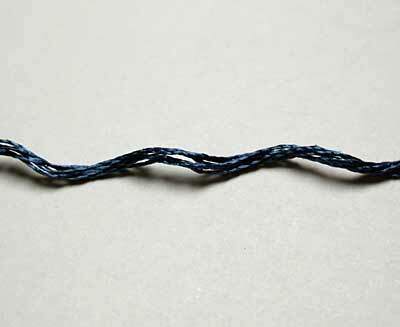 The silk is stranded – 6 strands in a bunch, like DMC floss. After I opened the skein into a large circle, I cut the point where the knot was, so that I had a bunch of very long strands of silk. I divided the bunch into three equal lengths. You can divide it just in half, but I think the stitching length would be too long, for reasons mentioned below. After cutting the threads to my stitching length, you can see that I had a rather boingy mass of silk… which would be a pain in the neck if it were left just like this – destined to knots and disorder… Plus, I don’t like the boinginess of some silks. I prefer, if possible, to calm that down a bit. Here, you can see that the thread is significantly “calmer.” How did I manage it? I put the kettle on for a cup of tea, of course! I didn’t think it right to play with silk from France without enjoying some good tea! As soon as the tea kettle was whistling, I took the silk bundle in my hands, holding one end in one hand and the other in the other, and moved it back and forth in the steam coming out of the whistling tea kettle. I do this with a lot of different types of threads and have never had any adverse effects. I don’t leave it soaking in the steam – I just pass it through. It goes straight immediately. Once the thread was straight, I let it sit while I found something to hold it with. I used a key tab, as demonstrated in my previous article on thread organization and key tabs. Using the method shown in that article and the article on preparing coton a broder, I looped the silk onto the key tab ring and loosely braided it. I secured the end of the braid with a slip knot made out of soft cotton thread, gently and loosely secured. 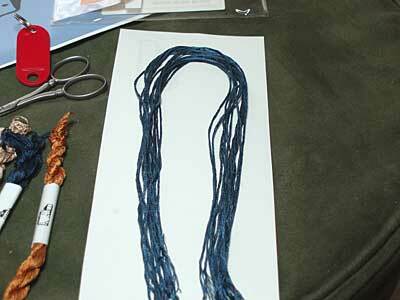 Now, I can pull one individual strand at a time from the braid. At last! 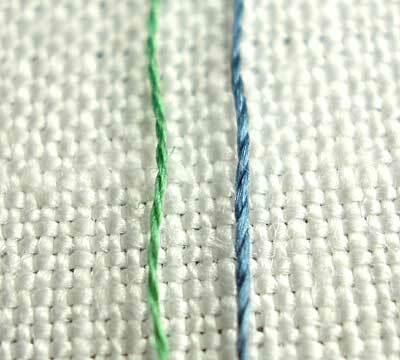 The comparison: on the left, one strand of DMC. On the right, one strand of Silk Mill silk. around the needle in the opposite direction. 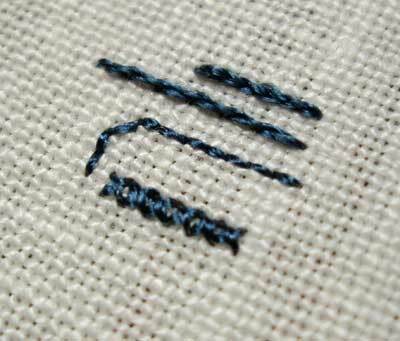 But for most stitching, the difference is minor, if not at all. Back to the strands themselves: you can see that one strand of DMC is slightly smaller than one strand of Silk Mill silk. Looking at a thread is never enough to tell you whether or not you will like it. You need to stitch with it! Put the thread through some paces and see how it feels. The thing is, I can never really “know” a thread until I stitch with it quite a bit. Still, a little bit of stitching should tell you right away if it’s likely you’ll like it. So I stitched a few small bits. First, I stitched a little satin stitch swash. 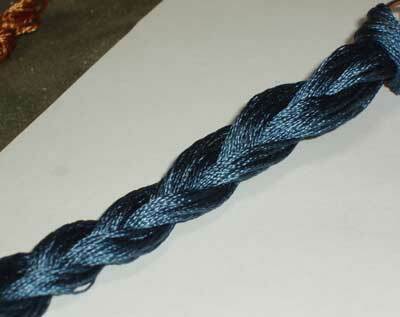 I also worked the chain stitch using two strands together. I worked some cross stitches, stem stitch, Holbein stitch (double running stitch) and back stitch, and some split stitch. 1. The silk is beautiful! It feels good in the hands – it doesn’t snag or anything like flat filament silk is prone to do. It’s smooth and luxurious feeling. The colors are vibrant and consistent. The thread is soft and fine. 2. I found it requires short lengths for stitching. As I neared the end of lengths of thread I was playing with, the thread started to exhibit some definite fuzziness. In short lengths, it performs fine (14 – 15″). 3. It stitches beautifully. The sheen is nice, and thread, though boingy at first, behaves ok. In this regard, I would classify the ease of managing the thread somewhere between managing regular cotton and managing rayon (which I always find to be more persnickity than other threads). The stitches looked nice, and the sheen is exceptional. With the current exchange rate, £17.50 ends up to be about $24.35 – $24.50. So one skein of silk would be $2.43 – $2.45US. And you know what? That’s not a bad price! Of course, there’s shipping to consider, but even with shipping, if I were ordering a larger order, I still think the silks would be a good price. This all depends, of course, on the fluctuation in the exchange rate, but right now, it’s not bad! If the skeins are £2 each, the work out to about $2.70… I think the economical way to go is to buy them in packs. 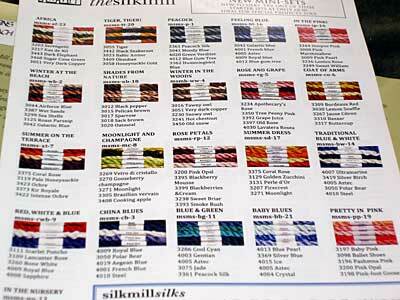 So… would I buy Silk Mill silks? I think I would! In fact, I think I will! I like them! I like the threads – especially the feel and the sheen; they have a magnificent color selection; and they are reasonably priced. 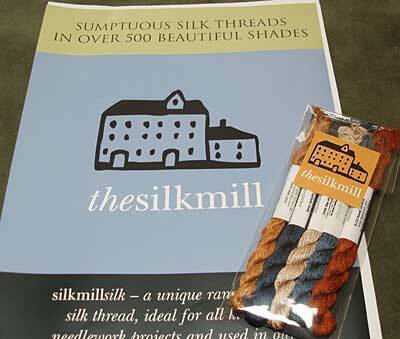 So, if you’re looking for silk, and you want to try something new, try the Silk Mill silk threads! If you order from them, tell them I sent you! And let me know how you like the threads… I’d like to hear other people’s opinions on them! Have you tried them already? Do you like them? What type of needlework do you use them for? And, finally, just so you know – I’m not affiliated, this isn’t a paid advert or anything like that! It’s just my review and my opinion… you may have a different opinion – if you do, don’t hesitate to share! Ahhh. It’s Friday – enjoy the weekend! 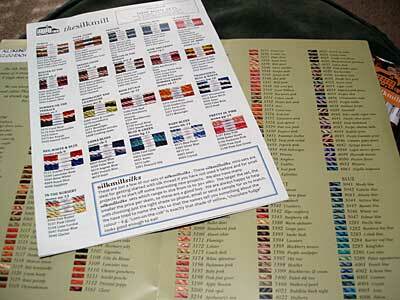 Questions: How would you compare the sheen of Silk Mill to other flat silks? Can you rank it in terms of your preference to other flat silks that you have tried? I don’t know if the Silk Mill is still doing this, but when I ordered their colour chart (which is completely free including shipping and arrived very quickly in California) I also received a sample skein of the silk. So, if you’re interested in a real life example you might try ordering the colour card to see if you get a free sample. I think it’s easier to compare the sheen of the silk to another twisted silk, like Soie d’Alger, because it’s twisted. In that case, the Silk Mill silk has a higher sheen. Is it as “shiny” as flat silk? Well, it’s close, anyway. The light plays on it differently, because it’s twisted, but it has a very high sheen for a twisted silk. Hm. Well, I hope that’s not as confusing as it sounds! Silk Mill just what I was looking for beautiful colours !! Hi Mary. Thank you for the review. I found it very interesting! How many yds/meters per skein of Silk Mill? I want to see wether it works out to more silk than d’Alger. It looks like a dream to work with! Thanks for yet another wonderful comparison! These are perhaps my favorite aspect of your site, thought I LOVE it all!!!!! Can I ask how long you had been embroidering before you started using silk thread? I ask because I use cotton floss or perle still and think it might be a while before my work justifies the expense of silk…. But I want something to look forward to! I never really had any serious interest in embroidery until I discovered the extended world of fibers. But then, I never considered embroidery as something that I had to practice for years before I actually did something “big.” I saw what I wanted to do one day, said, “I can do that,” and leapt in to it, testing, experimenting, and learning as I went. If you have the interest in embroidery – if you are sure you like the notion of this kind of needlework – then don’t be shy about your level of “expertise.” Find something that catches your interest and that you think you would love to do (or at least that you look at and love the finished product), and launch in. If you can read and trouble-shoot, and if your will is in it, you can do it! Sometimes, the medium helps the artist improve, methinks! I was mostly interested in the sheen and how you liked working with the thread. Did it catch at all on your fingers, etc. Well happily there is something that I learned during my medieval re-enactment time. I picked the Z-twist straight away. Pat on the back for me! Mary, just got my brochure and free skein. Thought i wouldn;t like the “sheen” but love it. I;m pleased about the coverage as i;m very fussy. 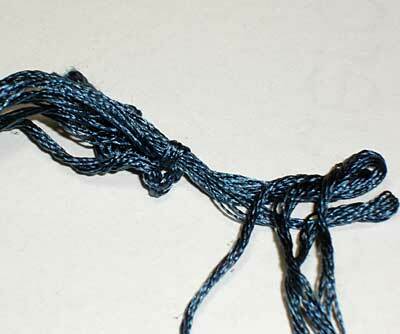 Lovely coverage 1 strand on 40 ct. …just got to get used to the bouncy feel to the thread. How do you know it is a filament? – it doesn;t say on their brochure. I always thought Spun Silk was the superior, but after a bit of research the Spun is made up of all the waste bits, as opposed to Filament which is one long strand. So, i don;t know how AVAS can price their silk so high considering it;s Spun. I did consider myself to be an AVAS snob as nothing wld compare in depth of colour and coverage… but I think I may be converted to Silk Mill. So thanks for finding them out. Great thing also I;m in UK so I don;t have to wait so long for an order…..I;ve been spending months trying to find a better priced silk than AVAS. 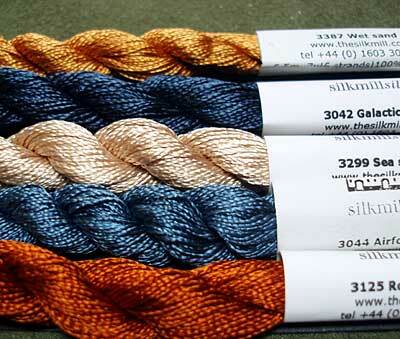 Discovered Krenik Silk Mori (£1.71) which i loved – but draw back is only approx 150 colours in range. 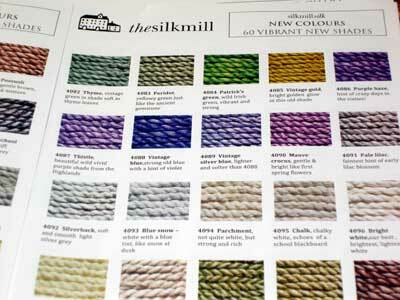 Great thing with Silk Mill is 500 colours in range. If it doesn’t say on the brochure that it’s a filament silk, then it must say it on the website. That’s a specific bit of info I sought for high and low! 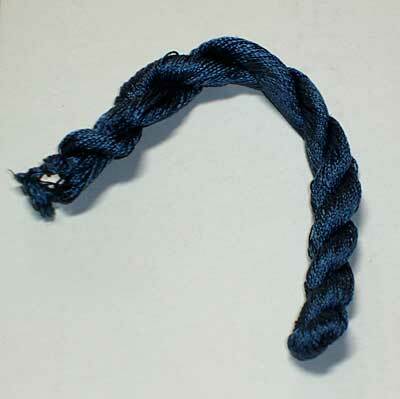 AVS’s Soie d’Alger is a spun silk – which is often the case with a twisted, stranded silk. Needlepoint INC silk is spun, Caron Waterlilies is spun silk, Dinky Dyes is spun silk, etc., etc. Just because it’s made from the scraps doesn’t make it necessarily “bad” or “poor quality” silk – in fact, I would imagine the process takes an extra step or two to create the spun silk. It is true that spun silk is not as strong as filament, and it doesn’t have as high a sheen, but this look is somewhat desireable, I think, on many needlework projects. So spun silk definitely has its place and advantages, and is still a very worthy silk to use! I’m glad you like the Silk Mill silk, though! 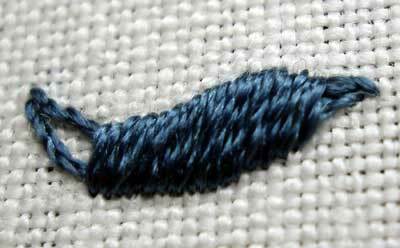 To tame the thread, you can use Thread Heaven (I don’t know if it’ll effect the sheen – you might try it to see if it does). The steaming does straighten it somewhat, but in comparison to other types of thread, even after steaming it lightly, it still has a bit of boing. Mary, I just found this company on FB and saw a link for this post. I would very much be interested in ordering from them as well. Could you email me?